1931 Crescent Lake Field, the Yankees spring training site since 1925, is renamed Miller Huggins Field in honor of the team's late manager, who passed away at the end of the 1929 season. In 1963, the facility will be called Huggins-Stengel Field, to honor another Bronx Bomber skipper, Casey Stengel, who is now piloting the National League's expansion team which is working out in the St. Petersburg ballpark. 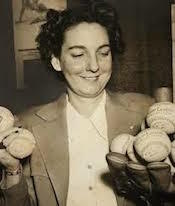 1946 The Phillies hire the first female major league scout when the sign Edith Houghton, who will ink fifteen players, mostly from Philadelphia high schools, to contracts. The North Philadelphia native will continue to scour the Philly area for local talent until 1952, before returning to the Navy to serve her country during the Korean and Vietnam wars. 1946 Three days before he will marry New York department store heiress Coral Gimbel, Hank Greenberg comes to terms with the Tiger, signing a contract for $60,000. The following season, after leading the American League in home runs (44) and RBIs (127), the slugging first baseman threatens to retire rather than take a pay cut, which prompts Detroit to trade the future Hall of Famer to the Pirates. 1961 Donald M. Grant, chairman and a minority owner of the Mets, offers Branch Rickey a contract to become the general manager of the new National League expansion team. After the former GM of the Browns, Cardinals, Dodgers, and Pirates turns down the job, George Weiss, who filled the same role with the Yankees from 1947 to 1960, accepts the position. 1973 In a national poll, Phillies' southpaw Steve Carlton beats out golf legend Jack Nicklaus to win the $15,000 diamond-studded gold buckled Hickok Belt, an award given to the top "Professional Athlete of the Year." Last season's National League Cy Young Award winner joins an elite list of previous recipients that includes Willie Mays, Sandy Koufax, Jim Brown, Rocky Marciano, and Arnold Palmer. 1990 With the issue of the implementation of salary cap unresolved, a thirty-two-day lockout begins when major league owners refuse to open spring training camp without reaching a new Basic Agreement with the players. The season will be delayed one week due to baseball's seventh work stoppage and will need to be extended for three days to accommodate the 162-game schedule. 2001 After turning down the Mets' offer of salary arbitration that at the very least would have been worth $2 to $3 million, Bobby Jones signs a one-year free-agent deal with the Padres for only $625,000. The 31 year-old right-hander, 11-6 last year with New York, will lose 19 games for the Padres this season. 2003 After the Dragons release Kevin Millar for an undisclosed payment, the Red Sox, who blocked Marlins' sale of him to the Japanese Central League team with a waiver claim, acquire the 31 year-old first baseman-outfielder (.306, 16, 57). In a complicated deal brokered by MLB, Florida repaid the money that Chunichi had paid for Millar, who previously down the opportunity to stay in the United States, and Boston compensated the National League team with a similar amount in return for Millar. 2006 According to Adam Katz, Sammy Sosa's agent, the 37 year-old slugger will probably retire eleven homers shy of becoming the fifth major leaguer to hit 600 round-trippers. Earlier, the Dominican outfielder rejected a non-guaranteed contract from the Nationals that included performance bonuses. 2006 Former Dodgers starter Jeff Weaver (14-11, 4.22) agrees to a one-year contract with the other team with Los Angeles in its name. The deal for the last major player left on the free agent market is worth $8,325,000, and the 29 year-old right-hander can earn an additional $600,000 in performance bonuses for innings pitched and game starts with the Angels. 2007 Ending more than two months of speculation about Barry Bonds' deal with the Giants, the commissioner office approves the one-year contract worth $15.8 million. The 42-year-old slugger had reached a preliminary agreement with the team early in December, but finalizing the contract was delayed when language about promotional appearances and an additional clause, stating San Francisco could void the deal with the outfielder if the alleged use of steroid leads to an indictment. 2007 The Yankees announce the team will wear black armbands on the left sleeve of their uniforms in memory of teammate Cory Lidle. The 34 year-old right-hander, along with flight instructor Tyler Stanger, died when their plane crashed into a 52-story high-rise apartment building in Manhattan on a rain-swept afternoon last October. 2011 Stan Musial receives the Presidential Medal of Freedom, an award in which the honorees are selected by the sitting president, from Barack Obama. The Cardinals' legend, who benefitted from the local grass-roots effort on his behalf, joins major leaguers Hank Aaron, Moe Berg, Jackie Robinson, Roberto Clemente, and Ted Williams, as a recipient of the most prestigious honor given to a United States civilian. 2012 The Rays and Joe Maddon agree to a three-year contract extension that will keep the two-time American League Manager of the Year with Tampa through the 2015 season. During his six-year tenure with the club, the 58 year-old skipper has compiled a 495-477 (.509) record, leading the team to the postseason three times in the last four years, including an American League pennant in 2008. "Baseball is known as our national pastime, but the game has deep roots and a rich history here in New York State. From the National Baseball Hall of Fame and Museum in storied Cooperstown to the Mets and Yankees — the pinnacles of Major League Baseball, to our recently crowned Little League World Series champions from Maine-Endwell, New York State is clearly the epicenter of baseball greatness. It is time that we formally recognize baseball as our official state sport." - JAMES SEWARD, New York state senator. New York State Sen. James Seward (R-Milford), thanks to a suggestion from a group of fourth-graders at Cooperstown Elementary School, announces he has introduced legislation (S.4288) to designate baseball as New York’s official state sport. In a press release, Hall of Fame president Jeff Idelson says he "enthusiastically supports” the proposed bill, citing Cooperstown serves as the spiritual home of baseball.